Become a Paranormal Field Investigator for the night! A SMALL GROUP EXPERIENCE, this interactive walking tour as they introduce you to the investigation of haunted sites. 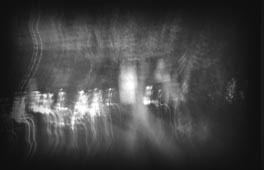 You will learn how to assess seeming haunted phenomena, and what does compromise an actual haunting.  What kind of phenomena make a "genuine haunting"
Can you tell which phenomena are real? We will share stories and anecdotes from the tour related to the sites we visit, and relevant historic details. The tour is not designed to frighten, but to engage and educate you in the investigation of haunted phenomena. During the tour's history we have experienced a wide range of paranormal phenomena, including occasional sightings, as well as paranormal sounds, scents and tactile encounters. Participants have at times described feelings and impressions that match closely actual events that we know have occurred in the places we visit. Each night is a novel experience, and what will happen is unpredictable. The tour is approximately 2 hours long. The tour investigates the grounds of the Castillo de San Marcos (the old fort), a courtyard and the periphery of two old cemeteries, all within the bounds of the historic district of our nation's oldest city. THE TOUR DEPARTS NIGHTLY FROM BEERHAMMER�S � Beer Gear Retail Store, located inside Heritage Walk Mall at 162 St. George Street � entrance on St. George Street at the Cathedral. See Directions Page for a Map. TOUR MEETS AT 8:45PM EACH NIGHT. We ask our guests to arrive at least 15 minutes early, for we do distribute equipment and take care of other preliminaries. CONTACT US AT: (904) 824-8840. (If no answer, (904) 814-8446, and specify the paranormal tour.) RESERVATIONS ARE REQUIRED, especially for Saturday night. Your tour guide will be a City of St. Augustine licensed tour guide. Your paranormal tour guide is trained according to the principals that tour founder Harry C. Stafford, Ph.D set in 2002. TOUR FOUNDER: Harry C. Stafford, Ph.D., has taught parapsychology on occasion and continues to pursue a lifelong interest in the field of consciousness studies. Dr. Stafford holds a doctorates degree from Florida State University in Human Consciousness Studies and a Master of Divinity from Harvard University. He is the author of "The Future of Human Consciousness". Copies of Dr. Stafford's book can be purchased at GhoSt Augustine Store at 123 St. George Street and its company sister store Beerhammer's Beer Gear at 162 St. George Street. If you want an even longer Paranormal Adventure then the Total Paranormal St. Augustine tour is what you want. The TPS tour is a 4.5 hour adventure with an intermission. The tour incorporates the Haunted St. Augustine along with a riding part to spots, whereof some are indoors, and some are outside of the Historic Downtown area. If you want to focus on investigating inside one haunted spot for an extended time, GhoSt Augustine offer ParaForce Investigations Level I, Level II, Level III and R.I.P. Overnight. Please call 904-824-8840 and look at www.ghostaugustine.com for more information. 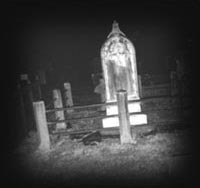 Can you see the face on the tombstone?